English Heritage Clothing Made in the UK | Peregrine Clothing. Peregrine is the brand name of J G Glover & Co Ltd. A longstanding British manufacturer with over 200 years experience proudly producing quality crafted knitwear in the UK. “All garments are manufactured in England” it says on their website. Available online and they have a by appointment showroom in Bristol. They manufacture fabulous wool jumpers and accessories (hats, scarves, socks) and wax jackets for men and women; and picnic bags. This entry was posted in Clothing, Hats and Scarves, Ladieswear, Menswear, Peregrine Clothing and tagged J G Glover & Co Ltd., Made in England, Peregrine, Peregrine Clothing, UK on November 24, 2013 by ukmade. Most Barbour products are not made in England nowadays. Most Barbour products are not made in England nowadays. Barbour make most of their classic waxed jackets in the UK. Everything else they make abroad nowadays. I checked with Barbour and they confirmed that ONLY their classic waxed cotton garments are manufactured in the UK. Despite them telling me this, it also seems that their hats or at least some of them are made in Scotland because I saw made in Scotland Barbour beanies in Liberty (on 7.11.12). Also, at least some of their scarves are made in Scotland and some of their socks are made in the UK (I saw some made in the UK Barbour cotton coolmax walking socks in John Lewis on 23rd November 2016; the other Barbour socks they were selling were foreign made). Look for the made in England (or made in Scotland) label – if something from Barbour does not have a made in England (or Scotland) label, then it is made abroad. Remember it is only the classic Barbour waxed jackets that are made in England. Other waxed jackets are made abroad, for example the Millom Waxed Jacket is manufactured within Europe. Barbour tell me that they manufacture the vast majority of their waxed coats within the UK, however it seems that more and more Barbour wax jackets are now foreign made. Basically most the items Barbour sell are now foreign made, which is disappointing because I think most of their customers still assume all Barbour products are made in England which is simply no longer the case. If there is no made in England label on a Barbour waxed jacket, then it is foreign made. That said I could not find a single waxed Labour jacket in John Lewis on 23rd November 2016 that was labelled “Made in England” so I wonder whether Barbour may not be labelling their British made jackets with country of origin anymore (already they do not label their foreign made products with country of origin in an attempt to deceive customers into thinking everything by Barbour is made in England). If the bit of Barbour kit you are thinking of getting is not labelled “made in England” (i.e. it is foreign made) there are plenty of great British made alternatives such as Campbell Cooper jackets (note their hats are foreign made), Peregrine, Lavenham Jackets and many more. Have a look under my clothing category for more ideas and for hats and scarves have a look under that category. 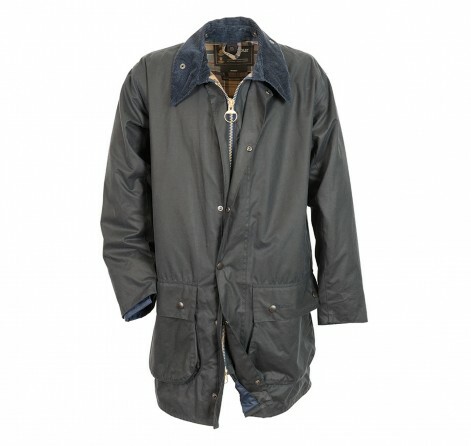 Below is the Border Waxed Jacket – a great bit of kit – made in the UK. Barbour Border Waxed Jacket. Made in England. This entry was posted in Barbour, Clothing, Outdoor Gear and tagged Barbour, Campbell Cooper, J Barbour & Sons Ltd, Lavenham Jackets, Made in England, Peregrine Clothing, South Shields, UK Made, ukmade on September 25, 2012 by ukmade.